Welcome aboard the Deccan Odyssey on the Maharashtra Wild Trail, an 8-day journey through the hinterlands of Maharashtra, the majestic Western Ghats, and the Deccan region located in the vast and diverse expanse of central India. This exciting journey includes the thrill of chasing tigers at two reserves with the highest density of tigers in Maharashtra, the awe-inspiring beauty of the art of Ajanta, exquisite sculptures in Ellora, and the holy city of Nashik, now also India’s wine capital. A railroad journey like no other, in a land like no other, we welcome you aboard the Deccan Odyssey. Extend your journey in Mumbai with a stay at our fabulous Virtuoso partner hotel: Taj Mahal Palace. Board the Deccan Odyssey at Chhatrapati Shivaji Terminus station mid-afternoon and begin your enchanting journey from Mumbai to Ellora Caves. Savor a delicious dinner on board. As you enjoy breakfast, the Deccan Odyssey arrives at Aurangabad, an industrial town in Maharashtra named after the last Great Mughal, Aurangzeb. Spend the morning at leisure on board, or choose the option of enjoying a relaxing massage at a hotel spa. After an early lunch, disembark for a scenic drive that takes you to Ellora Caves, carved into the side of a basaltic hill approximately 19 miles (30 km) from the city. The finest specimen of cave-temple architecture in India, the site encompasses 34 rock-cut shrines representing Buddhist, Jain, and Hindu art dating from the 4th to 5th century AD. The 12 caves to the south are Buddhist, the 17 in the center are Hindu, and the 5 caves to the north are Jain. The most remarkable is the Kailash temple, meant to be a replica of Shiva’s celestial abode on Mt. Kailash. It is the best example of rock-cut architecture and is an engineering marvel. Next, climb up to explore the lofty Daulatabad fort, occupied since at least 100 BCE. Daulatabad houses the remains of Buddhist caves similar to those at Ajanta and Ellora. You will then return to the Deccan Odyssey to freshen up before heading back to the city for dinner in a hotel. This morning, enjoy a leisurely breakfast before heading out to the Old City of Aurangabad. Spend the morning visiting Bibi-ka-Maqbara, the mausoleum of Dilras Banu, Aurangzeb’s wife, and a replica of the Taj Mahal at Agra. Built between 1651 and 1661 by her son, Prince Azam Shah, the monument is also called the ‘Taj of the Deccan’ and was intended to rival the splendor of the Taj Mahal. Next, visit a facility that specializes in the weaving of Himroo fabric. The fabric of choice for the royalty of that age, Himroo has been associated with Aurangabad since the 14th century, when Muhammad Tughlaq made the city his capital. Himroo features Persian designs woven with gold and silver threads and takes its name from Hum-ruh, which means “similar” in Persian. Return to the Deccan Odyssey for lunch on board, after which you can enjoy the rest of your afternoon at leisure on board as the hinterland of Maharashtra sweeps past, with its ever-changing colors and landscape. In the evening, enjoy a sun downer before dinner is served. Awaken before sunrise today as the Deccan Odyssey pulls into Ramtek for your game drive at Pench National Park. Named after the Pench River, which meanders like a mammoth python and splits the land into almost equal halves, this park is immensely rich in biodiversity, its terrain defined by hills, valleys, and the occasional precipitous slope. Pench National Park is an important ecosystem and supports an abundance of flora and fauna, including a rich variety of aquatic life. After an exhilarating game drive, return to the Deccan Odyssey for a leisurely brunch on board. Disembark again in the afternoon for your second adventure into the wild. The Pench National Park is four different forest regions in one: an extravagance of trees, shrubs, grasses, climbers, weeds and herbs, with teak being the most prominent of the tree species. Bird life here is equally bountiful and includes both resident and migratory birds: Malabar pied hornbills, Indian pittas, ospreys, grey-headed fishing eagles, white-eyed buzzards, storks, waterfowls, four endangered vulture species, and the green pigeon, which is the State Bird of Maharashtra. Afterwards, drive back to Ramtek station to board the Deccan Odyssey. 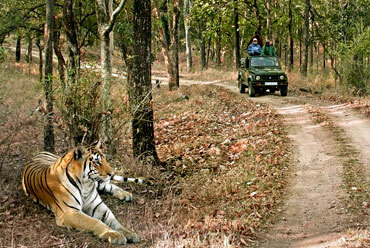 Enjoy a sumptuous dinner as the Deccan Odyssey departs for Tadoba, the land of the mighty tigers. Rise early this morning as the Deccan Odyssey arrives into Chandrapur station for your game drive in Tadoba Tiger Reserve. It is not uncommon to spot tigers and wild dogs here, and other species abound as well: leopards, sloth bears, gaurs (the Indian bison), the rusty spotted cat, ratels, various species of deer, wild pigs, and more. After an exciting morning, a late breakfast will be served at the Tiger Trails lodge, followed by leisure time, which may include viewing a documentary on wildlife or interacting with our naturalist. Enjoy lunch at the lodge before you drive back to the station to board the Deccan Odyssey. Sit back, unwind, and enjoy cocktails fixed by our bartender on board, followed by a sumptuous dinner and a well-deserved rest as the Deccan Odyssey proceeds towards Jalgaon to visit the exquisite Ajanta Caves. After breakfast on board, disembark at Jalgaon station this morning and drive to Ajanta Caves, a World Heritage Site and architectural marvel. The 30 rock-hewn Buddhist caves at Ajanta have been masterfully carved and are adorned with sculptures and paintings of Buddhist religious art, depicting universal pictorial art as well as the fusion of the Buddhist and Hindu faiths. After exploring Ajanta, return to the Deccan Odyssey for lunch as the train takes you towards Nashik. The rest of the day is at leisure for you to relax and enjoy some of the activities available on board. Watch a movie, learn the rules of the popular Indian board game ‘carrom’, or book yourself a relaxing massage in our on-board spa. Relax and watch the tapestry of rural India unfold as you sip a sun downer before dinner. Today you arrive in the holy city of Nashik, which is quickly gaining status as the wine capital of India. After breakfast on board, disembark for a morning stroll along the Godavari Ghats. Along the way, you will witness several important Hindu rituals. Continue your walk through the lively Wednesday market, where you can buy everything from vegetables and lentils to dried seafood and cow dung cakes. Later, drive to the Grover Zampa vineyards for an exclusive tour of one of India’s finest wine producing facilities. Walk through vines laden with Chenin, Chardonnay, and Shiraz grapes. Learn more about the age-old “méthode traditionnelle,” used to make one of the best-known brands of sparkling wine in India. Allow the sommelier to acquaint your taste buds with the finest creations of white, red, rosé, and sparkling wines before you pair them with your meal at the vineyards. After a sumptuous lunch, return to the Deccan Odyssey and set forth for Mumbai, the last leg of the journey. The rest of the day is at leisure on board. After an early breakfast, disembark in Mumbai and bid farewell to the Deccan Odyssey as your royal passage through the grand vistas of India comes to an end. Pricing is per person and does not include 5% service tax. Government tax rate subject to change without notice. Medical & evacuation insurance is required for this journey. An Indian visa is required for U.S. citizens. Tiger at Pench National Park. Kailash Temple at Ellora Caves. Luxurious Deccan Odyssey dining cars.